Yesterday was a treat on many fronts. 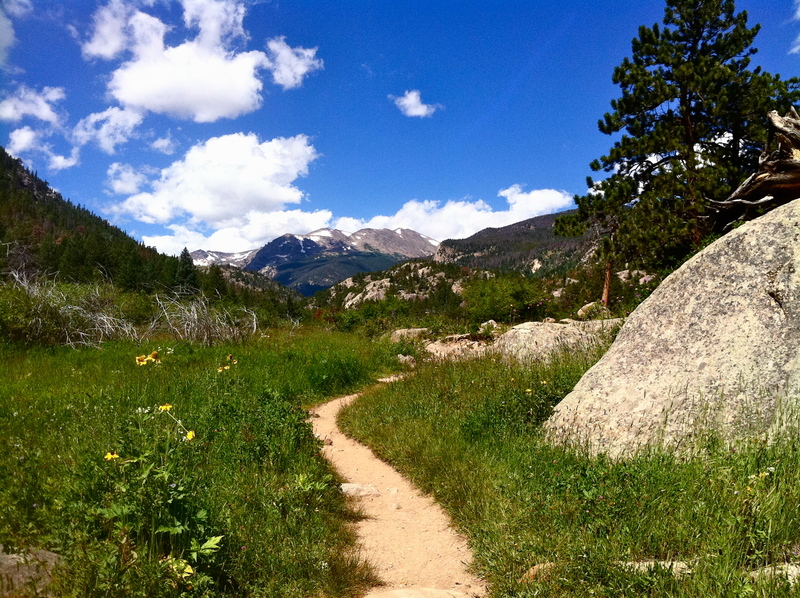 I had the whole day free, I was accompanied by good friends visiting and we found a perfect trail in a gorgeous part of the Rocky Mountain National Park. My friend, Adair, and I went to grad school together and have shared a number of fantastic hikes when we travelled around India and Nepal together. It was like old times being out on a trail with her yesterday. Brad, her husband, as well as a very talented photographer, joined as well so I have some fun pics to share. They were recently posted in the foreign service in Athens Greece, so he spent a lot of time covering the riots. I shared his work during Philosophy Week when I was over there visiting them. But now back to the hike. Just about 45 minutes away from Boulder through Estes Park is the Rocky Mountain National Park and not far within is Moraine Park where I went horseback riding recently. When we were there we saw lots of trailheads and I knew I wanted to go back and investigate. 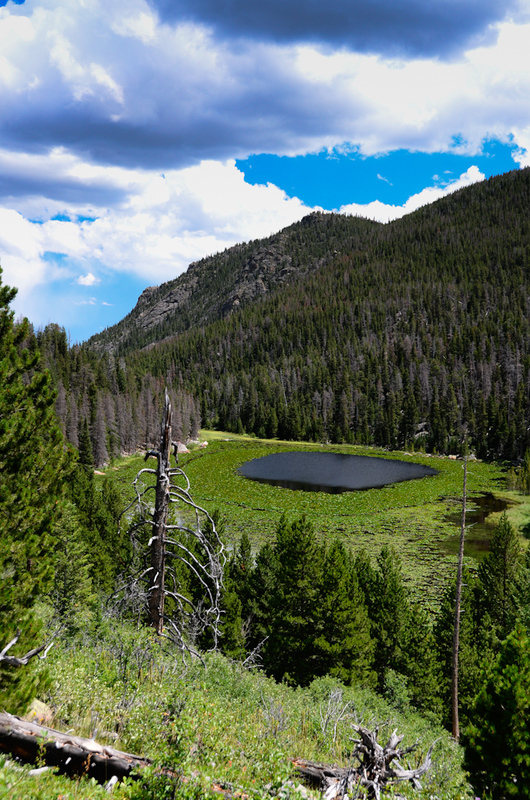 Cub Lake is a pretty easy trail at 2.3 miles each way and is mostly flat with a steady incline towards the end. It’s at 8,000 feet, so not too hard on the lungs either. The best part is that it’s absolutely gorgeous. 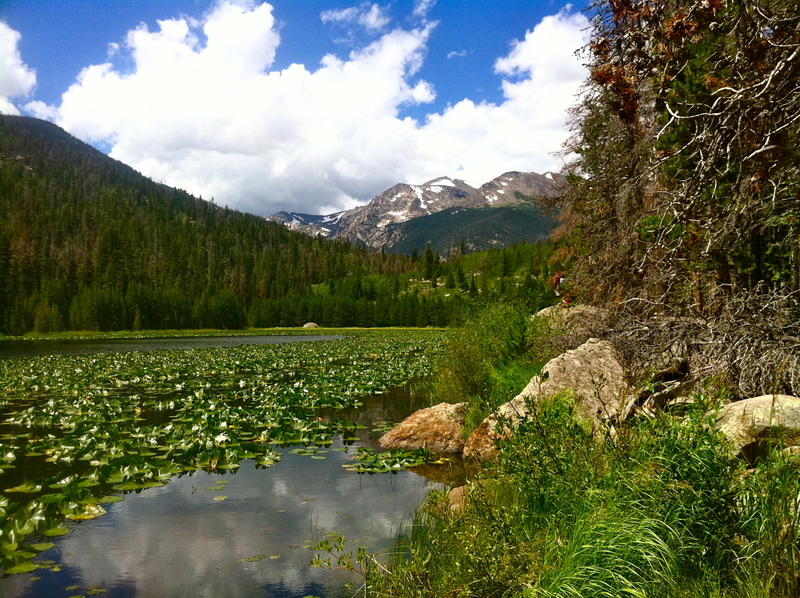 You start in the valley crossing a river and make your way past ponds and gorgeous wildflowers. 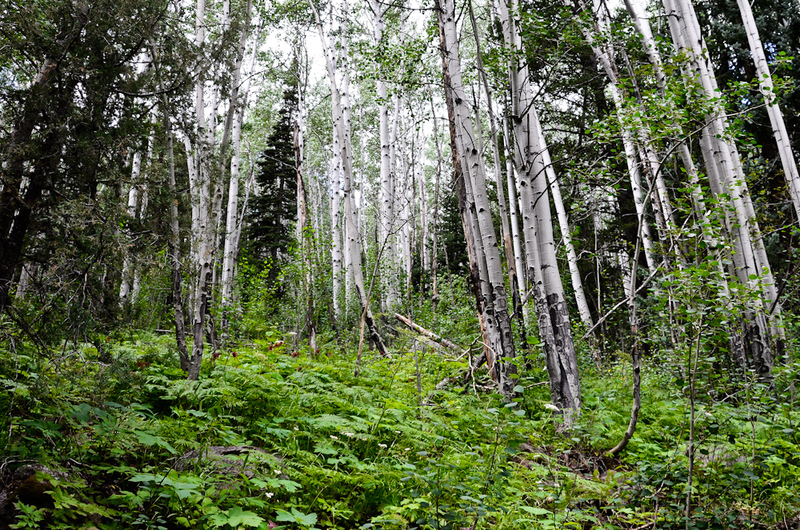 Eventually you start winding your way up through a forest of aspens and ferns. After about an hour or so we reached Cub Lake which is just idyllic. I’d love to go back and spend a day there with a good book. Upon arriving we were greeted by some of the fattest chipmunks I’ve ever seen. This must be one place in the park where people have disregarded the sign about not feeding the wildlife. My friend ended up with one on her lap trying to decipher where the food was hidden in her iPhone. When hiking you find yourself striking up conversations with those around you. We shared a rest stop with a family visiting from Boston. Every time someone asks me where I’m from and I say Boulder the reply is always the same: “You’re really lucky”. After the hikes I’ve been on this week, I wholeheartedly agree. We also ran into a couple wearing “bear bells”. My friend asked if they had seen any bears. I casually asked the wife if she hiked by herself with the bells and she blew up at us. “NEVER! You should NEVER hike alone.” and then proceeded to lecture us further. I didn’t want to mention that while her bear bells might work on bears they also kind of turn her into a giant cat toy. I personally would be a bit more afraid of the mountain lions around than the bears given their size. 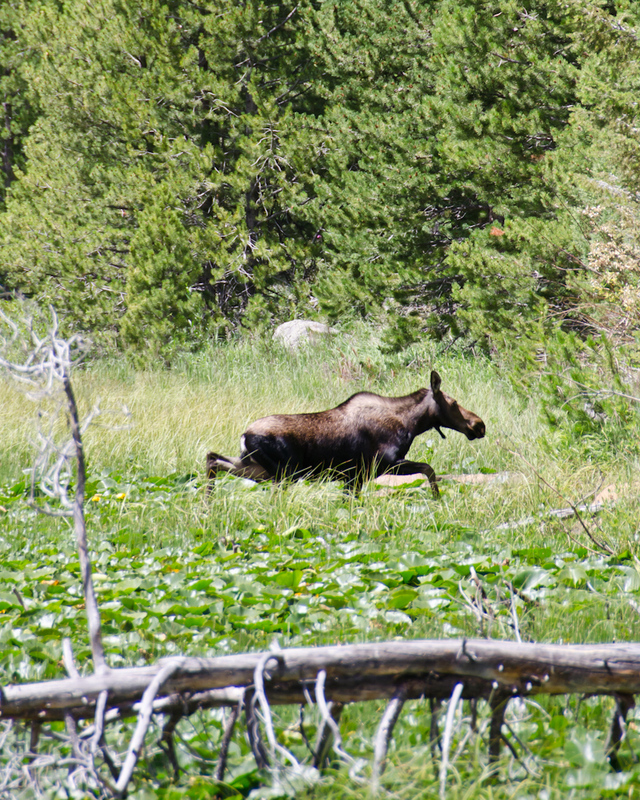 While we didn’t come across bears or mountain lions, we did see a moose when we got to the lake. She was just chillin’ in the lake eating lily pads. Brad got a great closeup of her. That was my first moose sighting. There were of course some not-so-bright tourists getting a little too close forgetting it’s a 900 lb animal. We had to start heading back since the clouds were rolling in, but Brad was able to capture Cub Lake from a pretty fantastic vantage point. 1) Come up with a game plan beforehand that everyone knows. We could either have headed back the way we came or have taken a few other trails to get back. We got split up at the lake and one of us thought we were going to do the other trails while two of us planned to head back the way we came. Hard to coordinate with no cell service at that point. We all eventually made it back to the car. 2) Bring snacks. We had plenty of water but no snacks and started getting hungry. 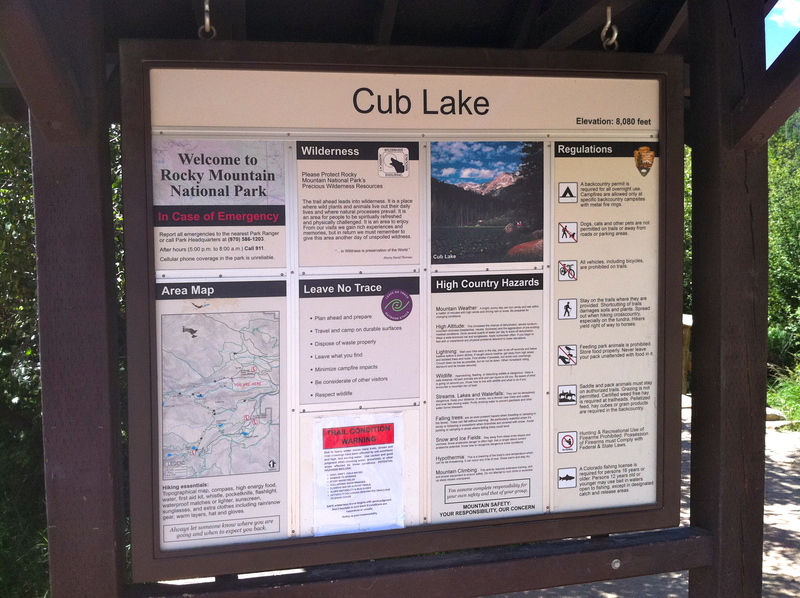 You are currently reading Hiking Cub Lake at 52 To Do.